Three years ago a Los Angeles woman had a new cosmetic procedure, a stem-cell face-lift. During this procedure the surgeon liposuctioned adult stem cells from her stomach fat and after isolating them, injected those cells back into her face and around her eyes. In this case the doctors extracted mesenchymal stem cells—which can turn into bone, cartilage or fat, among other tissues—and injected those cells back into her face After some time, the woman was experiencing difficulty opening her right eye, and whenever she tried, she heard a strange sound. Eventually she consulted a second plastic surgeon, complaining of these symptoms. At first the consulting surgeon thought she was exaggerating, but she did indeed have a swollen, drooping eyelid. This was no overactive imagination at play! After more than six hours of surgery, the consulting surgeon and his colleagues had dug out pieces of bone fragments which had been growing in the flesh around the woman’s eye. The strange sound the woman was hearing whenever she tried to open her eye was bone grinding against bone. Why did this occur? During the patient’s initial aesthete treatment, her surgeon had injected some dermal filler along with the stem cells. Although plastic surgeons have safely used dermal fillers for more than 20 years to plump up the skin and obscure wrinkles, the principal component of such fillers is calcium hydroxylapatite, a mineral which encourages mesenchymal stem cells to turn into bone, the probable explanation for this woman’s unanticipated predicament. THIS STORY WAS REPORTED IN SCIENTIFIC AMERICA. Although the consulting surgeon successfully removed the pieces of bone from his patient’s eyelid, no one can say for sure if her saga has ended as some living stem cells possibly have remained, to turn into bone in the future. We all tend to get excited when we read about the next NEW thing to enhance our beauty. But MORE is not always better and NEW hasn’t yet stood the test of time. Cosmetic surgery is a constantly evolving field, but let’s be cautious and let the science precede the hype. For more in depth information about Stem Cells, where we are now and where we are headed, read Dr. Alan Kisner’s informative article: STEM CELLS IN THE NEWS. I’m not opposed to cosmetic surgery. Not at all. Those who know me, know that I think it can be a pretty wonderful experience. But today’s headline in the Daily News; Hack plastic surgeon . 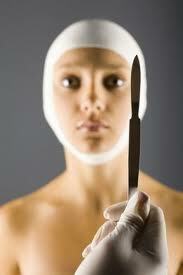 . . faces murder rap for performing liposuction on heart transplant patient made my skin crawl just a little. I felt incensed! With all the competent, highly ethical plastic surgeons out there, doesn’t it make you wonder how this beautiful 51 year old woman fell into the hands of such an irresponsible one? I immediately went through my articles to find one I had written some time ago: How Do You Find the Surgeon Who Is Right For You. So here is my plea to you today. If you are considering any type of cosmetic surgery, please do yourself a big favor and read this article first. It just might save your life! 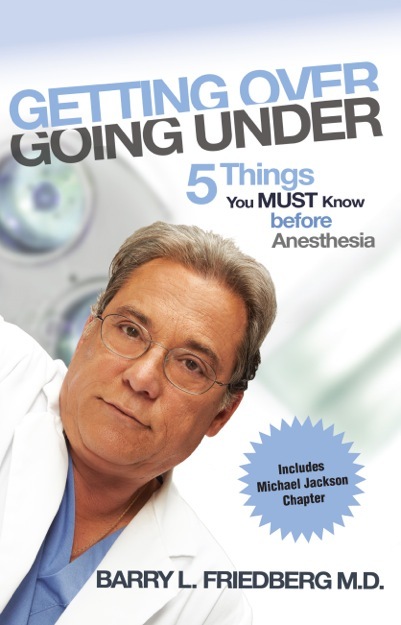 And if you want the details about this surgical horror story, you can read it here. My Facebook author page is quite new, but gaining momentum quickly. I invite you to LIKE my page. And while you’re there, don’t miss the inspiring stories, my ‘Inner Beauty’ stories. You can also click on the word FOLLOW in the upper right corner of this blog to stay connected. Last year, 4,329,180 aesthetic BOTOX® treatments were administered to women in the United States to relax their forehead frown lines. The side effects to these treatments have been minimal to non-existent. Slight bruising or swelling at the injection site, if any, has been found to resolve within twenty-four to forty-eight hours. Occasionally, an eye has temporarily drooped after forehead injections, but also resolves within a period of a week or two. But there have been no reports of any effects on the central nervous system. And as far as risk of death from Botox Cosmetic, the FDA confirmed that: There has never been a reported death where a causal link to BOTOX® (Botox Cosmetic) was established. But new fears about BOTOX® surfaced shortly after an Italian study reported in the Journal of Neuroscience revealed that when botulinum toxin, type A (the active ingredient in Botox), was injected into one side of adult rats’ brains, minute particles of protein in the toxin were found in the other side of the brain. The media went wild with headlines such as: Botox Causes Brain Damage. Speak about false alarms and taking things out of context. If you are anything like me, the details will blow your mind! If you are interested in giving yourself a better education on this topic, I’ve done the hard work for you. 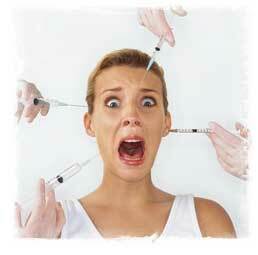 Here’s the link to my article on Botox and Safety and many more. WHAT CAN WE DO ABOUT THOSE AGING HANDS? We’ve all seen it before, a young face, with old looking hands – the dead give away to a person’s age. The tell tale signs: wrinkled skin, brown spots, protruding veins, tendons and bones . . . An aging appearance is no longer measured just by facial lines and furrows, sagging jowls or waddle necks. As the public becomes more tuned to aesthetics, the appearance of the upper surface of one’s hands increasingly comes into play. 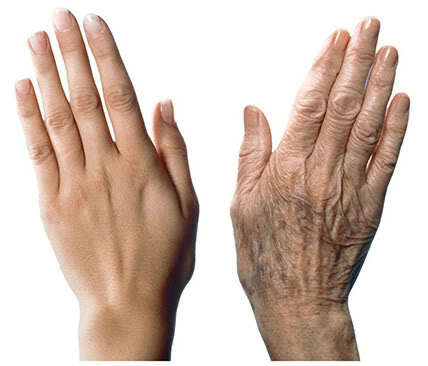 As we age, the fatty layer of our hands gradually thins. Our hands lose volume, fat and elasticity. As a result, the skin becomes more translucent and wrinkled, causing underlying structures as bones and veins to become more apparent. The elements of sun, wind and rain also are unkind to our hands. Hands constantly exposed to the sun develop brown spots. The drying effects of the elements cause further skin wrinkles. Many surgical and non-surgical treatments are available to rejuvenate both facial and body features. What solutions can science offer us for aging hands? Let’s start with the basics. Protect your hands from the elements by wearing gloves during times of inclement weather. Apply sunscreen, ideally SPF 50, to your hands several times during the day. Remember, each time you wash your hand, you are also washing away the protective sunscreen. So carry a small size sunscreen in your purse and reapply it often. Moisturize your hands as well as your face with a good quality moisturizer. Prescriptive strength hydroquinone or Retin-A help erase signs of hyperpigmentation. If these products don’t do the trick, lasers would be the next step up in treatments. Dermal fillers – synthetic ones such as Radiesse, Juvederm or Perlane or non-synthetic ones and non-synthetic ones as the patient’s own fat – are one viable solution. Injected under the first layer of the skin to plump it up in a 5-to-10-minute procedure, fillers work very well, but must be repeated as their effects diminish over time. A second solution is energy driven devices as intense pulsed light, Fraxel or CO2 laser resurfacing. What about surgical hand lifts? Can excess skin be surgically removed? Not anytime soon. For one thing, hand surgery is likely to causes obvious scarring. Secondly, hands pose a greater risk of complications. And beautiful hands would be a poor trade off for hands that don’t function as they should. In an earlier article I wrote about Madonna’s Eyes – how young and beautiful they appear. But have you noticed that she often wears fingerless gloves during her performances – most likely to hide her less-than-young-looking hands? Can’t science do something more for aging hands? Not at the moment, but never say “Never”. Advances in cosmetic surgery are driven by demand, and hand rejuvenation is a hot new topic.